Roses are the main product group for everybody. Who doesn’t love Roses… but we are the true experts in the field. In fact, our Flower Gallery holds almost 1,000 different varieties. They are all organized into color groups, with substitutes and other pertinent information. Since Roses are so popular, it was one of the main reasons why, in 2006, we opened our office in Ecuador, THE rose capital of the world: to bring you the widest selection of Rose varieties. We recommend that you plan ahead in order to maximize the beauty and longevity of the roses you deliver to your customers. Important factors include storage location, handling on arrival, processing best practices, and tips on how best to handle roses both before and after they leave your shop. Do not process flowers close to air vents, next to fruit (ethylene) or in freezing temperatures. Clean the cooler (keep the temperature of the cooler around 34-36 degrees Fahrenheit and relative humidity around 90%). Clean and disinfect containers (use bleach and a scrub brush). Fill containers with clean water and preservative. Use proper water temperature (if water is too warm (above 110 Fahrenheit) during conditioning, roses may open prematurely). Clean and sharpen tools (do not use scissors, they tend to mash the stems). Cut – don’t pull! – sleeves and bands from flowers. Pulling may damage them. Do not unpack more flowers than you can process within 30 minutes. Flowers should not be left on tables or in boxes at room temperature. Place unopened boxes in a floral cooler. Prevent bottom of the box from getting wet by placing boxes on a pallet. After receiving the roses, remove some of the leaves on the lower part of the stem, but make sure that you do not remove any of the plastic or paper around the rosebuds! Remove foliage and thorns that will be below the water line. It is not recommended to remove more than 1/3 of the foliage, however. Leaves are needed to help “pump” water up the stem. Use extreme caution while de-thorning the roses: leaf and stem wounds allow air bubbles to enter the stem which impedes water uptake. Cut the stems at an angle at least ½ – 1 inch. Cut the stems under water, in order to prevent air bubbles from sealing off the stem (it only takes a second for a rose stem to dry out!). Re-cut stems under water every two or three days. This will prevent wilting or bent necks. Let the roses hydrate (“drink”) outside the cooler (condition at room temperature to increase water intake) for 1 ½ hour and for at least another six hours (some people recommend up to 12 hours!) inside the cooler. Now the roses are ready for further processing and arranging for sales. Continue to change water regularly (every two or three days). Inform your customers of “at-home” care procedures. Keep flowers away from a spot that is too hot (bright sunlight), cold or drafty. Re-cut stems under water and every two or three days. Include preservative package with every purchase. Ask the customer to limit the time the flowers are kept in the car. We do not recommend that you wire the roses because it will not improve the performance. To increase water intake, it is preferred to avoid floral foam. 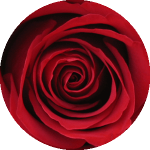 If you are designing roses in floral foam, soak foam thoroughly in a preservative solution. Never adjust the height of flowers in foam. If foliage seems dry, mist the foliage lightly, but do not mist the blooms. Water droplets are breeding grounds for fungus, also known as botrytis. While processing the roses, you may come across some roses with spots on the outside two guard petals. Do not panic: these petals have purposely not been removed at the farm in order to protect the rose from any shipping damage. Also, in case you come across any black edging, do not panic: this is Mother Nature (caused by cold days at the farm during the growing process), and it is not an indication of poor quality. Processing the flowers any different from described above (for instance: using and selling the roses immediately upon receiving) may result in quality problems. Tip: increase consumer interest in colored varieties with a special promotion on a multi-color arrangement! Please call us at 404-320-1619 or email sales@cutflower.com. Cut Flower Wholesale is the Atlanta-based premier fresh-flower wholesaler importing the finest florals from around the world.